Under snow-capped Mount Taranaki unfolds the vibrant city of New Plymouth. Midway between Auckland and Wellington, this active center of the Taranaki region offers plenty of opportunity for outdoor adventure from its crowning peaks to its coastal plains. Explore this award-winning city like the locals do: on foot or by bike. Known for its extensive promenade, the Coastal Walkway offers eight miles of sea-edge, multi-use paths that run the entire length of the city from Bell Block mouth to Port Taranaki. Take in views of the Tasman Sea and iconic Te Rewa Rewa Bridge while exploring the downtown area, City Shopping Centre, Fitzroy beach, and fantastic selection of Indian restaurants. With a temperate climate and rich volcanic soil, New Plymouth is well known for its gardens, including nationally-acclaimed Pukekura Park botanicals gardens and Pukeiti, a nationally renowned rhododendron garden. See New Plymouth from every perspective. Look to the heavens from the volunteer-run New Plymouth Observatory or take to the sky with a scenic helicopter tour of the Taranaki Region. Explore surrounding waters and the protected Sugar Loaf Islands to see a variety of fish, seabirds, dolphins, whales, seals, and more. This collection of seven islands off of New Plymouth’s coast are the remnants of an ancient volcanic crater. Go beneath the water’s surface to see cliffs, canyons, reefs, and expansive sandbars. On the other side of the city’s harbor is Paritutu Rock, another volcanic vestige. Climb its rocky slopes to take in stunning views of New Plymouth’s coastline, the not too distant mountains, and the waiving, kinetic art installation, the Wind Wand—a Len Lye designed piece. Vast and breathtaking, New Plymouth offers a taste of the wild meets the wonderful contrast that is New Zealand. Explore New Plymouth through this innovative museum, visitor information center, library, restaurant, and café—the world’s first multi-purpose building of its kind. 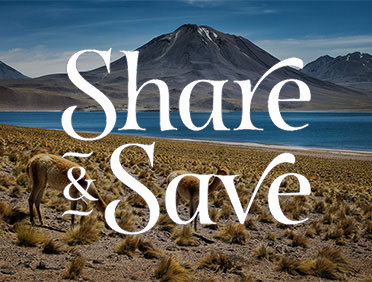 Four permanent exhibitions offer the opportunity to discover the Taranaki Region’s past, present, and future through multimedia displays and galleries. Connect to local culture from this integrative building that attracts tourists from around the world. Behold a fantastic display of modernism both inside and outside of New Zealand’s Govett-Brewster Art Gallery. The striking wavy, mirrored exterior invites you to explore a collection of works by kinetic artists Len Lye, as well as a fine assortment of exhibitions, films, and events dedicated to modern art. Walk the halls, catch a documentary, or skim the gift shop for a unique gift. Drive just south of New Plymouth to explore this mountainous park that offers a mixed terrain of lush rainforests and alpine shrublands set amongst pasture farmlands. Trek up New Zealand’s most climbed mountain, the dormant volcano Mount Taranaki. Walk through tall kamahi and rimu trees. Travel to Dawson Falls to see a series of connected waterfalls. Get to know New Zealand’s wilderness up close. Join your naturalist guide for a hike through the lush forest to the summit of Mt. Egmont. Stroll the Te Kainga Marire Gardens and explore the exhibits at the Mt. Egmont Visitors Centre, learning about this spectacular volcanic peak. 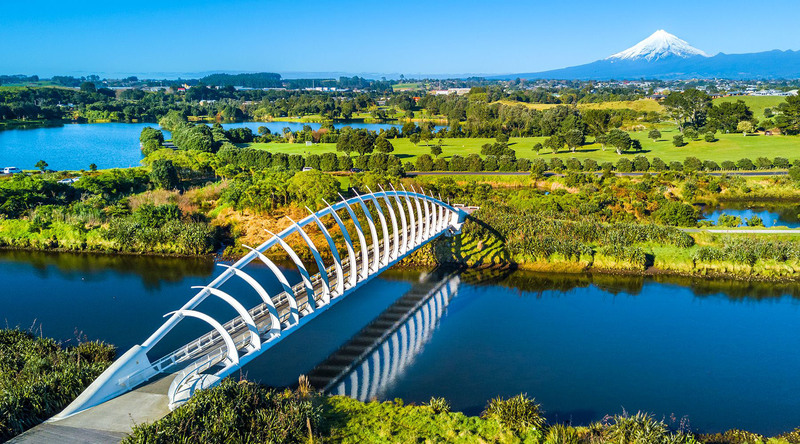 Enjoy the scenic landmarks of New Plymouth on a drive along the cost and cross the Te Rewa Rewa Bridge on foot.